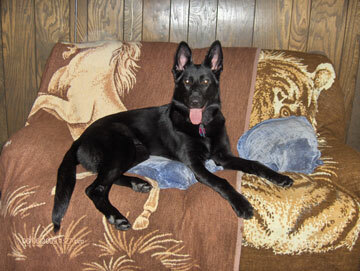 Elsie is a solid black GSD (spayed) and will be 1 year old 11/19/11. She fits into the chart perfectly. I ensure that she gets the best quality dog food that I can afford. I've been feeding her Chicken Soup for the Dog Lover's Soul Dog Food, which is a holistic food, since she was a little pup. She gets a 30 to 45 minute walk daily and then lots of romping throughout the day with her best buddy, of all things, a Bassett Hound! For her training treats, I make my own; dehydrated chicken breast jerky and dog biscuits. This way I can ensure no preservatives or chemicals. Her coat sparkles! She is my fourth girl over a twenty year period. There is no other breed to compare! Beautiful black GSD! Looks like she a little princess! German Shepherd are GREAT and we as an owner might be just a bit prejudice but Labrador Retriever are wonderful too, my black Lab, Ebony is now in Heaven, she was a princess and she was something else too! Just like other breeds, we all love our dogs! German Shepherds just have a reputation as a "Top Dog", a very well respected breed, they are special that's for sure, it all started with Rin Tin Tin! When we walk our GSD, my beautiful Mia people would say "look at that Shepherd, beautiful and they always want to pet her, she be 2 yrs old on 11/10/11. You can read our stories puppy Mia story, Mia my beautiful GSD on this website. Take care of your girl Elsie and she will take care of you.